In case you haven’t been following our little Make: Believe project with 2K, we’ve taken up the challenge of recreating four weapons from the game in real life (based on art files provided by the game developers). That’s largely thanks to the help of Shawn Thorsson’s maniacal work ethic and165 pounds of rubber molding (and counting). So far, we’ve talked about the whole project, gave you a little insight into the game, and revealed the first bit of gear: The Lazarus Device. 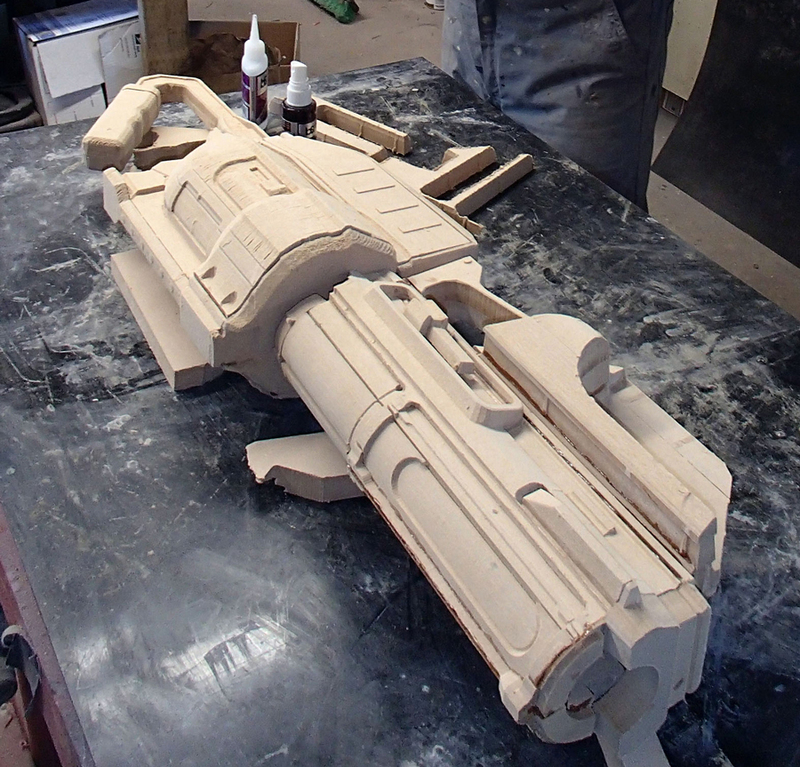 Today, we’re showing off Shawn’s work on Griffin’s Harpoon Gun. This is one of my favorite guns so far, mostly because because of it’s unique “sci-fi harpoon gun” concept: the developers over at Turtle Rock Studios did a great creating Griffin’s Harpoon Gun for the upcoming videogame, Evolve. Below is the in-game model and the hi-res cutscene model, respectively. The Trapper class is what you’d expect from a big game hunter….that hunts giant, evolving Monsters. His abilities give him a leg up on tracking, locating and trapping the beast. And that Harpoon Gun of his? Well, it’s a pretty effective Monster deterrent at close range. While we weren’t about to create a fully functional Harpoon Gun, we needed it to look the part – with the gun mechanism and a separately loaded harpoon! He started the gun like the others: He took the in-game model, and ran it through his Carvewright to get the basic shapes. Ton of sanding, gluing, adding 3D printed bits and even a trip to the lathe and you have some pretty convincing parts to start with. 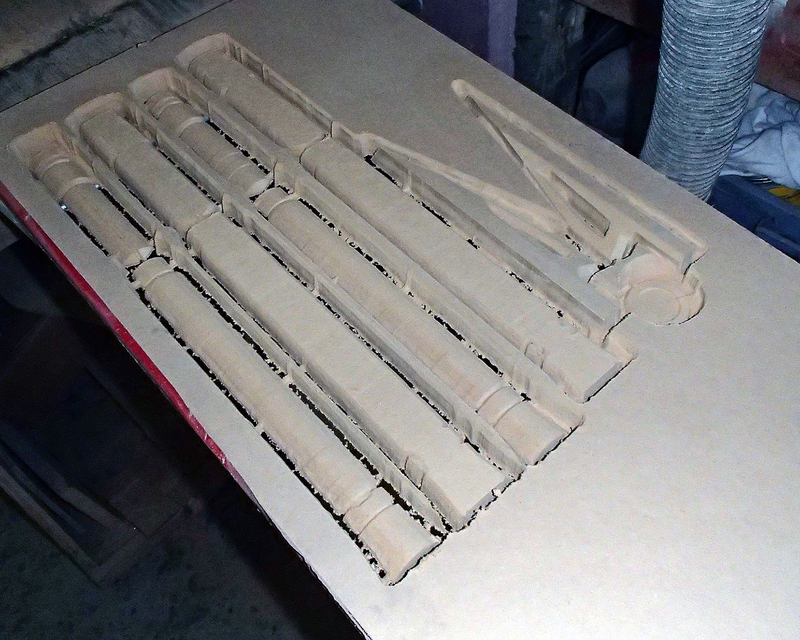 The main body was sanded very near to smooth. 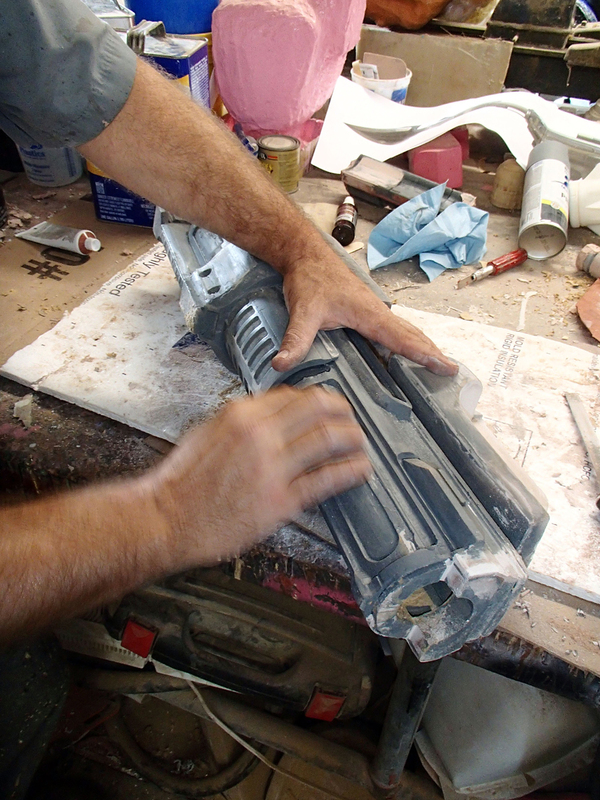 Shawn made molds of all the different parts and laid down a fiberglass mothermold one half, then flipping the whole thing over and started the rubber jacket mold for the other side. 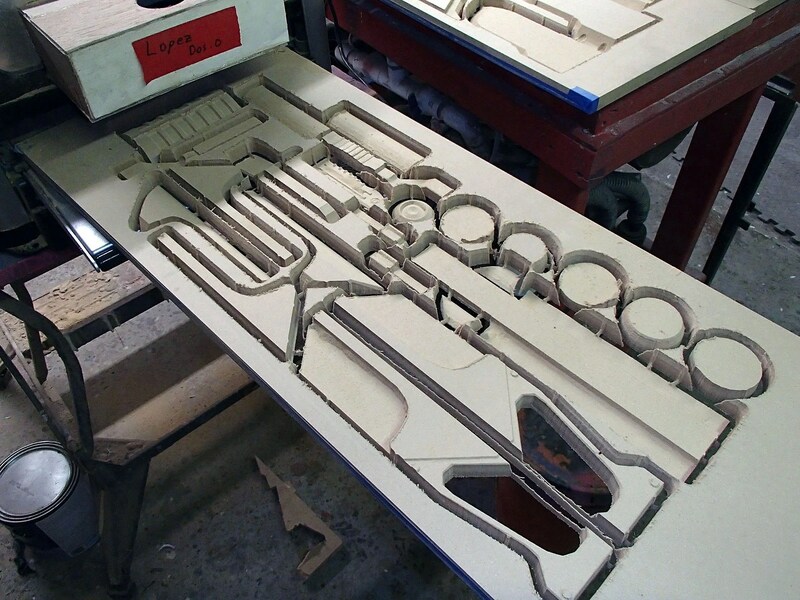 These will be 2-part block molds in silicone rubber. The lights that sit under the main body will also be separately cast. There’s a little more sanding and filling before they’ll be ready to mold. That brings us up to two of the four weapons we’re building in August. We’ve got a lot of work to do in a very short amount of time now, but next week, we’re going to show off the last two weapons….and show you how they turned out! Here is a gallery of pics showing the process!